808 Alcatel Belkin Contest End of Summer Giveaway lenovo moto Roku 2016 End of Summer Giveaway! 2016 End of Summer Giveaway! 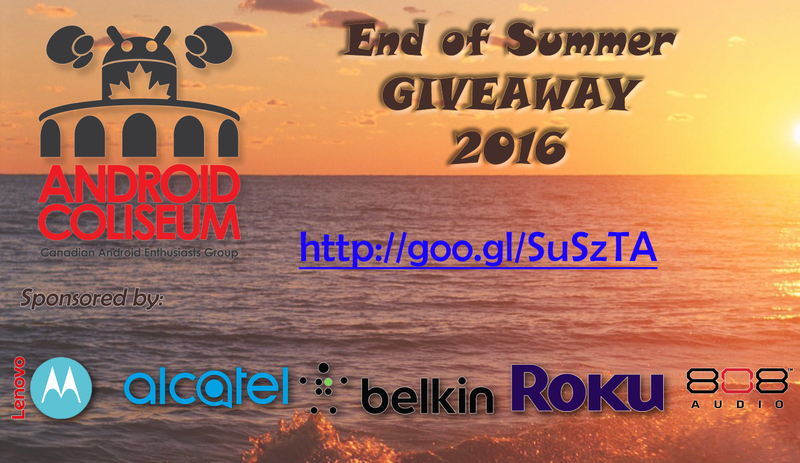 Thanks again go out to our sponsors of the giveaway: Lenovo/Moto, Alcatel, Belkin, Roku and more. #1 - Confirmed winner - Darrell H.
#2 - Confirmed winner - Will H.
#3 - Confirmed Winner - John T.
So what do you have to do to be entered? Just check out the separate contest entries below. Check out the rules and conditions at the bottom of our site to make sure you're eligible and some of the basic details. Winners will have 24 hours to respond to our messages (we'll contact you via the method you won, i.e. Twitter, email, etc...) otherwise, we'll re-draw that prize. Best of luck everybody! And truly, thank you for sticking around our site. We're here because of you, and our sponsors recognise that, so go and show them some love as well. 1 - you must have a Canadian address for us to ship this to you. Shipping is expensive, and we're paying for this out of our own pockets, so... sorry. 7 - thank our sponsors with a circle, or follow, or like, or ... or ... something; they're awesome!